We are looking for a candidate to fill the Microsoft Dynamics AX Retail Technical Consultant position for an award-winning Microsoft SI Partner based in United States. The Dynamics 365 for Operations Technical Architect leads the design of technical components related to ERP and Retail processes. 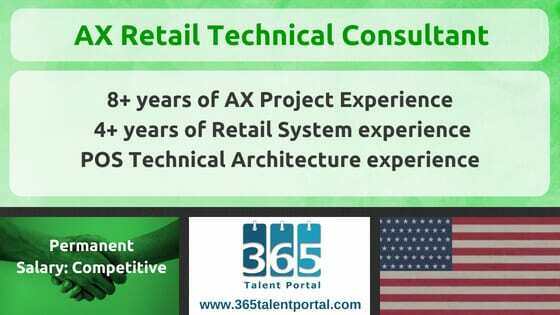 They are experts on technical architecture including extensibility, customization, integration, and POS hardware. You will work with prospective clients to understand their key technical requirements. You will present the Microsoft Dynamics 365 aligned components to the client’s technical team. You will also provide input to estimating the technical workstream for the project. Finally, you will advise the delivery team during the solution design. Our clients core offerings target different aspects of a client’s value chain – both across the enterprise and at the intersections of assets, process, polices, and people delivering value.